Powers/Abilities: Although Vira had a misshapen (by human standards) appearance and red skin, she displayed no superhuman abilities. History: (Eternals I#1) - Queen Vira attended her husband Brother Tode in his courtroom in Lemuria as they watched Warlord Kro discipline a human-like Deviant by forcing him to grovel before them. Vira observed as Brother Tode commanded Kro to journey to the City of the Space Gods in an attempt to prevent the Celestials from returning to Earth. (Eternals I#3) - When Kro returned to Lemuria in failure, Brother Tode had him tortured before the Royal Family of Deviants in punishment. Kro begged for another chance, and promised the Family of Toads that his new plot to appear before the humans as the Devil in order to trick them into attacking the Celestials would succeed. (Eternals I#8) - Vira watched as the Reject Ransak performed for the Royal Family. She, like all proper Deviants, was disgusted by his near-human appearance. Later, she attended the gladiator matches held as the Eternal Thena visited Lemuria. She was put-off by what she considered haughty treatment by Thena. (Thor I#286) - Following the destruction of Lemuria, Vira was among the Deviants who dwelt beneath New York City in a new Lemuria alongside Brother Tode. She witnessed Warlord Kro's latest attempt to regain the favor of the royal family by capturing several of the Eternals, and their ally Thor. However, they escaped their bonds and in the resulting battle, New Lemuria was destroyed. Brother Tode escaped, but chose to take his lover Dragona with him rather than either Warlord Kro or Queen Vira. (Iron Man Annual#6) - Queen Vira joined the rest of the royal family in their invasion of Olympia, during which they were able to take the entire population of Eternals hostage. Brother Tode attempted to become immortal by breaking the Eternals down into energy and then consuming them, but their plan was foiled by the arrival of the hero Iron Man. Vira, and all of the royal family were taken captive by the Eternals. (Avengers I#247-248 (BTS)) - It was later revealed that the Deviants captured were rebuilt into a large block of matter which came to rest in Olympia. When most of Olympia's population formed a Uni-Mind to depart Earth, it took the block of Deviant-matter with it. Comments: Created by Jack Kirby. 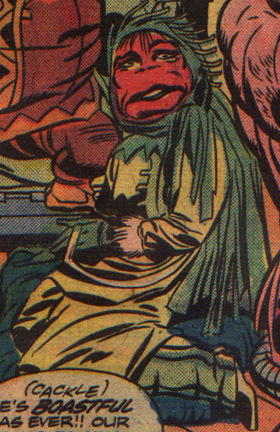 Vira's name was not mentioned in any of her appearances, but comes from the Official Handbook of the Marvel Universe#3. Big thanks to my friend Brendon Lutwyche of Sersi's Loft for providing me with the image.